2. a manner of healing. 3. a surgical procedure or operation. 2. In surgery, a process or operation. 1. a manner of healing; see under healing. 2. a goal or desired end. Medicine The process by which or the manner in which a wound heals. a kind of healing process. Healing by primary intention is the initial union of the edges of a wound, progressing to complete healing without granulation. 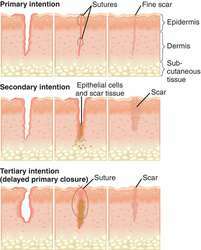 Healing by secondary intention is wound closure in which the edges are separated, granulation tissue develops to fill the gap, and epithelium grows in over the granulations, producing a scar. Healing by tertiary intention is wound closure in which granulation tissue fills the gap between the edges of the wound, with epithelium growing over the granulation at a slower rate and producing a larger scar than the scar resulting from healing from secondary intention. Suppuration is also usually found. 2. surgery A process or operation. n 1. consciously committing to act in a definite way. 2. wound healing of approximated edges. a manner of healing, e.g. first intention when a surgical incision heals immediately, second intention when a gaping wound fills with granulation tissue and is then covered from the sides with epithelium. See also wound healing. tremor of the head or a limb which increases as the patient tries to perform a particular function, e.g. following a moving object by moving the head. See also intention tremor. Intention motivates you, giving you determination and push towards your goals. Explicit intention is the direct explosion of user's wishes which can easily detect from text documents. Intention is a fundamental organizing principle that underlies all our actions in the world. The findings confirm the theory of planned behavior and contribute the impact of attitude and PBC entrepreneurial intention from developing countries context but remained inconclusive for subjective norms from gender perspective. Despite the efficacy of both models in predicting intentions (variances have been reported between 21% and 40% (Krueger, Reilly & Carsrud, 2000; Schlaegel & Koenig, 2014), predictors of intention in the TPB theory do not provide sufficient or necessary reasons for the formation of intention (Bagozzi, 1992; Fazio, 1995). While our common sense seems to tell us that intention matters to ethical evaluation, there is considerable disagreement among ethicists regarding why and how it matters. Part B: This part captured measures of attitude, subjective norms, perceive behavioural control, academics' intention to share knowledge, emotional factors and knowledge sharing behaviour. are statements of our intention to reach a desired goal and imply our commitment to achieving it. The subtitle, "Buddhaghosa on Mind, Intention and Agency," suggests a study of the great fifth-century Theravadin commentator, Buddhaghosa, but again he is not the focus of this book. Cairo, July 10th (BNA) --The Egyptian Dar Al-Efta'a stressed that the inner intention is a condition of the true fasting and one of its important pillars, and its time starts from the sunset till little before the Fajr Azzan, and if the inner intention is held after the Fajr time, so fasting is incorrect among majority of scholars. The mechanisms underlying the implementation intention effect are said to be enhanced accessibility of preselected cues, and strong mental links are formed between the cues and actions specified in implementation intentions. When one has an intention, it is informed by belief, and he or she will likely act on that intention in the future.